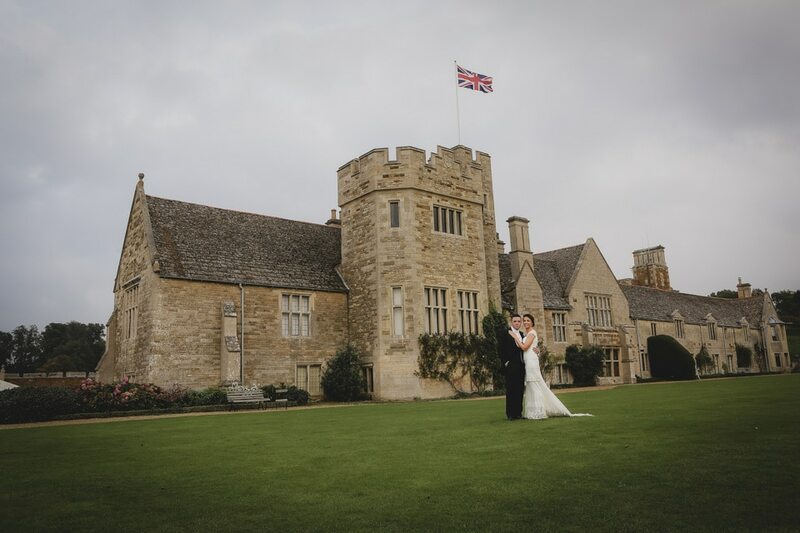 Aimee and Neil booked me for their Rockingham Castle Wedding a year in advance. I spent the next 12 months excited to shoot their day, with the possibilities that Rockingham offers for photography being huge. Rockingham Castle – Drama on the Escarpment! Very few weddings have “all the elements”. Dramatic historical venue? Check. Sweeping views offering vast horizons? Check Dramatic weather? Check. The autumn mist that shrouded the castle in the late afternoon could not have been more perfect for ethereal bridal portraits in the medieval setting. I had no idea that Rockingham Castle had been built by William the Conqueror. Being a bit of a history geek, I was a tad impressed, and a bit embarrassed, as this stunning castle is right on my doorstep. Taking Aimee and Neil out for a short session for portraits before dinner gave them a few much-needed moments together to chat about their mornings. 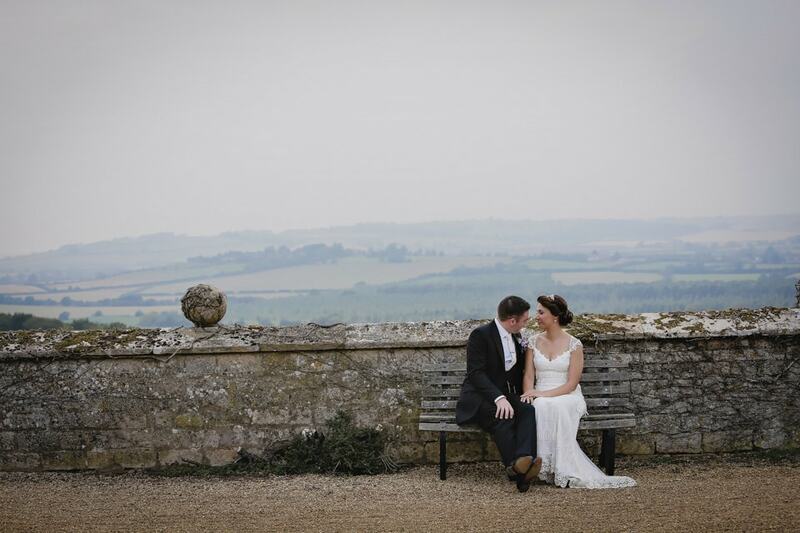 Sitting on the castle wall, with five counties as their backdrop, I was able to photograph them with a long lens at distance, so that their images were intimate and natural. Aimee and Neil were determined to “nail” that heart shaped group portrait on the lawn. (Which is fairly tricky with 150 guests!) See if you can spot the nods to Aimee’s Scottish / Japanese heritage – with origami on the tables, and the odd kilt around too. A truly lovely couple, with the nicest friends. 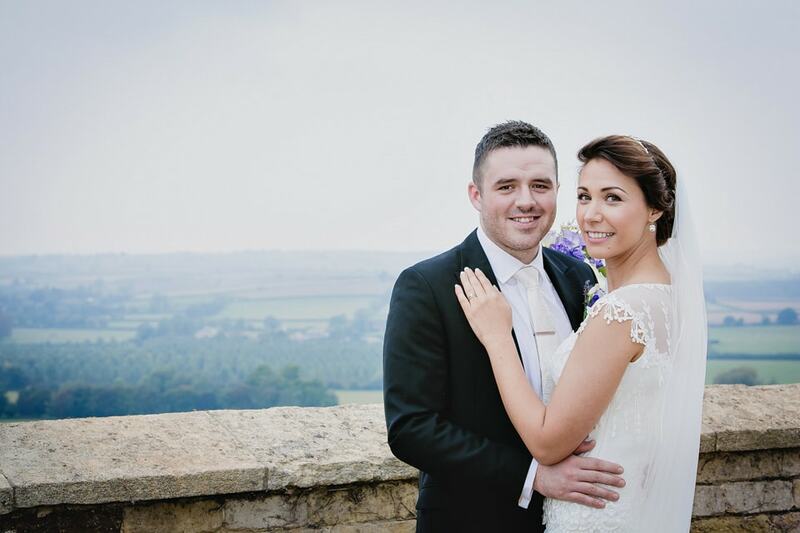 Aimee & Neil’s wedding was preceded by an intimate family ceremony at the quaint Gretton church. A hint that autumn was just around the corner – with fairly low clouds and mist around the castle walls giving Rockingham an even more imposing presence. Aimee had chosen vintage styling for her dress and hair, with a truly elegant hair piece that was a big talking point on the wedding day.